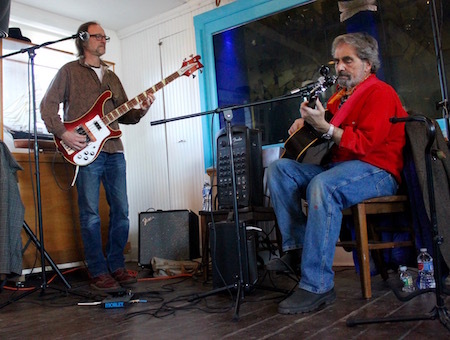 Greenporters got a sneak peak of this season’s exhibits at the East End Seaport Museum on April 8, along with an afternoon of sea chanteys with Dave Berson and Dave Nyce, a.k.a. The Two Daves. An exhibit of Jeremy Garretson’s breathtaking photos of where the land meets the sea, many of which were captured through drones, will open on the museum’s opening day, Saturday, May 27 from 1 to 4 p.m., followed by an exhibit of bayman and photographer Chris Hamilton’s work in June. Arlene Klein, who is serving this year as chair of the museum’s board of directors, said later this summer the museum is planning to repurpose its westernmost room, where Mr. Garretson’s exhibit is currently displayed, for children’s programs through the Paul Drum Nautical Education Fund, an eight-week free summer program for children ages 6 to 11 that includes instruction on rowing boats, nautical safety, making fish prints, sea chanteys and other nautical activities. That room had formerly been home to the museum’s exhibit about Bug Light, which has been reinstalled in the main exhibit room. 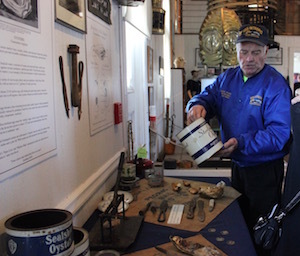 This summer, the museum will hold cruises to Bug Light every Saturday at 4 p.m. beginning May 27, and will be bringing back its weekly lecture series, mostly on Thursday evenings. Mr. Garretson will be giving the first talk of the season. The schedule was being finalized at press time, but will soon be online at www.eastendseaport.org/programs. Chris Hamilton is the first mate and only hand on his father, Bob Hamilton’s boat, the Jeremy H., named for Chris’s brother, Jeremy, who passed away in 2010 after a battle with cancer. 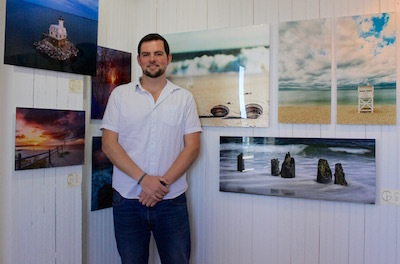 His first photography show will open at the Seaport Museum on June 23 at 5:30 p.m.
Mr. Hamilton, who has been working with his father on the bay since he was five years old, studied environmental science and marine affairs at the University of Rhode Island. He began helping his father on the boat every season again in 2011. He’s preparing an exhibit to educate the public on the tools baymen use in their daily work, which will accompany his stunning and intimate photographs of his life and his father’s life working on the bay. An exhibit on Long Island oysters, once a staple of Greenport baymens’ catches, prepared by the museum’s treasurer, Lynn Summers, is also on display. “We’re working on making this more contemporary and always appreciating the history. It’s a very special place,” said Ms. Klein. The museum’s official grand opening is Memorial Day Weekend, and after that the museum will be open Saturdays and Sundays through June from 11 a.m. to 5 p.m., and then daily except for Tuesday July through Labor Day from 11 a.m. to 5 p.m. Prior to Memorial Day Weekend, the museum is open Saturdays from 1 to 3 p.m. and by appointment. More information can be found at www.eastendseaport.org.